It is 1976, and the warm summer skies of Mayville, Florida bring a mounting sense of excitement. Fourth of July flags flap in the breeze in harmony with the high spirits of the town. Ora Lee Beckworth, recently widowed and childless, chooses to befriend an aimless old black man. 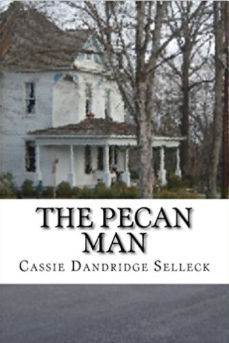 The Pecan Man, a Southern fiction novel, written by author Cassie Dandridge Selleck, opens in a time of great racial discrimination. In this 144-page book described as To Kill a Mockingbird meets The Help, readers experience an intricate story involving truth and a web of lies told from the perspective of the narrator, Mrs. Beckworth. Mrs. Beckworth observes life from the perch of her front porch sipping a glass of sweet tea with her loyal housekeeper Blanche close at hand. Blanche, who despite her name, was black as a raven’s coat. The neighborhood streets are lined with prolific pecan trees, and it is here by Mrs. Beckworth’s cottage that a colored man by the name of Eldred Mims, or the so called the Pee-can man is introduced. He spends most of his hours peddling his rusted old bike and dragging a rickety mower throughout the town plucking pecans from the sidewalks and streets. Most of the town is frightened by the Pecan Man simply because he is homeless and black. His mysterious life provokes talk in the small town, and mothers call their children inside whenever he appears on the streets. When the body of a 16-year-old boy is found near the Pecan Man’s dwelling location in the woods, he is quickly accused of the murder. Through an unfortunate series of events, Mrs. Beckworth and Blanche know the Pecan Man is falsely accused. However, in a post-Civil Rights era, convincing a southern town of a colored man’s innocence is futile. Twenty-five years after the life-altering incident, a endearing story unfolds as Mrs. Beckworth challenges herself to tell the truth about the Pecan Man. The Pecan Man reveals the struggles of racial discrimination. Although the book is written in a short and simplistic format, there is a greater, thought-provoking message behind the story. I would recommend this read to older teens and young adults as they can better appreciate the historical significance of the book. This novel promotes a theme of friendship and family that crosses barriers. Although the characters have flaws, they desire to do the right thing. They are forced to make difficult decisions and are uncertain if they chose the right path. As Mrs. Beckworth tells her story, she discovers truths about herself. Although heartbreaking, the story has many twists and turns that are unexpected. Sadness, prejudice, revenge, and bravery intertwine leaving the reader exasperated at the ignorance of people in authority and stunned at the disregard for humanity in the legal system. Selleck crafts each of her characters as spunky and somewhat opposing in viewpoints. The characters are likeable, relatable, and realistic for the time period. Their accents and dialect add to the story. It is fascinating how the characters compliment the others’ differences. On a deeper level, I believe Selleck used their personalities to show how even the most opposing personalities can work together to for a common goal if there is a desire. The reader is humbled as he witnesses the love, loyalty, hardships, and happiness of Mrs. Beckworth, Blanche, and the Pecan Man. We all have the ability to do the right thing regardless of what others think. I praise Selleck who dares to break down the boundaries of discrimination through this little Southern beauty.